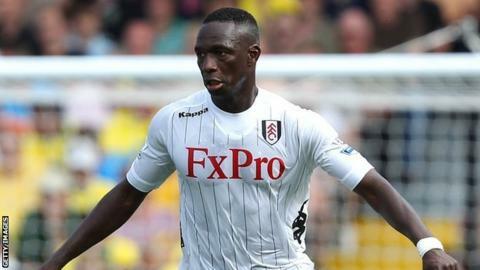 Fulham's Mahamadou Diarra could be set for a prolonged absence amid fears he has damaged cruciate ligaments. The 31-year-old injured his knee playing for Mali earlier this month. "There's a little piece of cartilage floating in his knee," said Cottagers boss Martin Jol, who revealed the midfielder would need an operation. The Dutchman added that if the damage was more severe than first thought, then Diarra could be out for "three, four, five months at least". Diarra, who had featured in Fulham's first three Premier League games of the season, ended a 15-month exile from international duty by appearing in Mali's 3-0 win over Botswana. But the former Real Madrid and Monaco midfielder then missed Saturday's 3-0 win over West Brom.